The man in the hat…..Pierce catches his breath in the background as his team-mates pose for the cameramen. There will surely never be another landmark date in Gary Pierce’s life to match the one that reminds us how his stunning performance against Manchester City in the 1974 League Cup final came on his 23rd birthday. 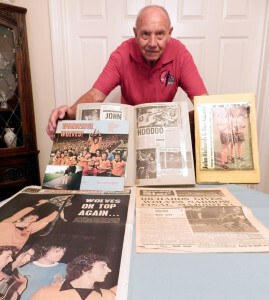 The fact that tomorrow marks 35 years to the day since he left Molineux for Barnsley, though, encourages us to now air some of present-day Wolves scout Les Green’s memories of a keeper he was delighted to have as a good pal. Les kindly contacted us through Facebook to point out that it was he who had provided one of the fashion accessories that made it on to the Wembley pitch before the game and also on to several of the post-match celebration photos. 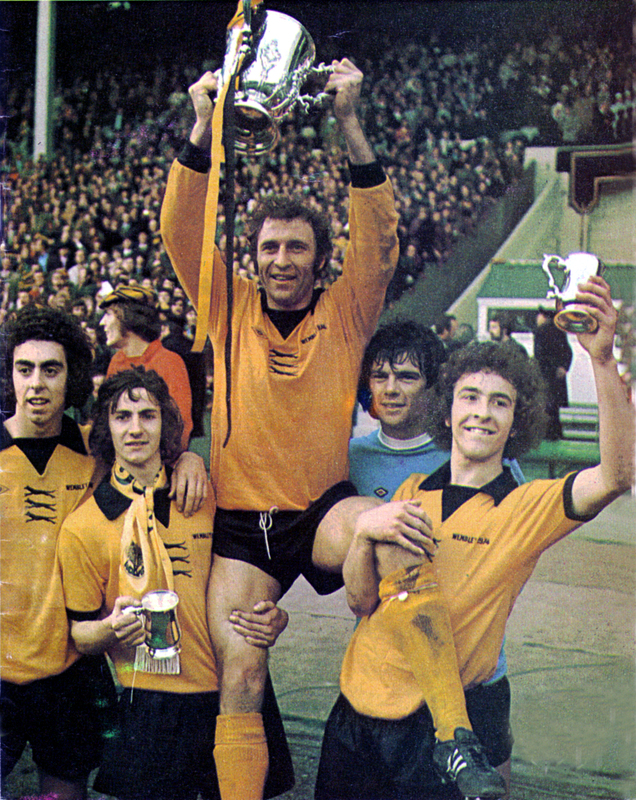 We are not talking here about the red jersey that must have haunted City’s forwards for years but the gold and black headwear Pearce paraded in afterwards. 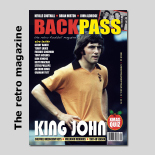 “I had a gold and black cloth cap, which I had probably bought at the old souvenir shop behind the North Bank and then worn when following Wolves on their trips to Academica Coimbra, Den Haag and Juventus in the UEFA Cup,” Les wrote. “Gary was a close mate at the time and took a fancy to it. In fact he said he was having it to keep his gloves and other things in as a lucky charm! He was clutching at straws a bit after he came into the side for the injured Phil Parkes and we drew at home to Stoke and then lost at Sheffield United. “He took my hat to Everton three weeks before the final but it didn’t bring him any change in fortune because we lost 2-1. I observed that he kept it outside the net, though, and said that must be why it had not brought him any luck. “He said he never put anything like that in the net in case the ball followed it but I persuaded him to try and we beat Birmingham 1-0 at home. It was his first clean sheet and was followed by a 0-0 draw at Manchester United, where he saved an Alex Stepney penalty. Les, an Academy scout at Compton who has the same name as the keeper who played for Brian Clough at Derby a few years before, has regaled us with one or two more anecdotes from the Wembley build-up and aftermath. 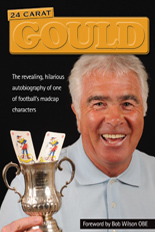 “In the week prior to Wembley, Bill McGarry bawled Gary out in training for not going for a cross,” he added. “So Gary went for the next one and missed it completely. ‘That’s better’ McGarry shouted! “For me, Gary’s best moment in the game was when he ran about 16 yards to take the ball off Denis Law’s head. Phil Parkes knew all along he had no chance of playing after his injury but kept up the pretence that he had a chance in order to take the pressure off. “As a result, Gary was not aware until the week of the final that he would be playing. That explains why he didn’t have his name in the line-up in the programme. 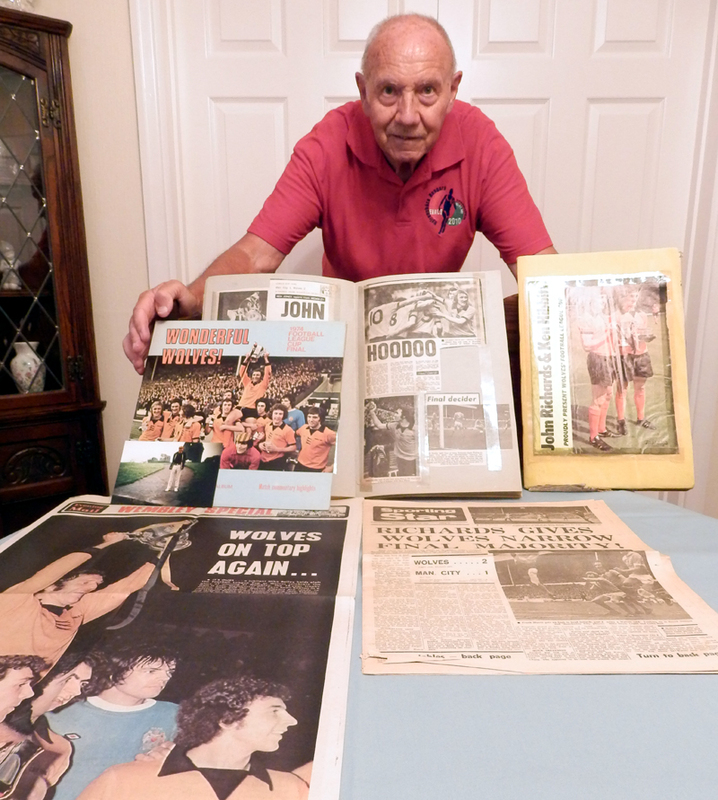 Les Green and his 1974 memorabilia. “I walked round the inside of the stadium afterwards and bumped into the Express & Star’s John Dee, who I knew from travelling to away games. He thought John McAlle was man of the match. I argued that it had to be Gary and told him to look on TV at the reaction of McGarry at the end. “I then met Gary’s wife, Jo, who was just numb with it all. I spent the next day round at their house in Codsall watching the highlights with them all. Posted on: Saturday, July 26th, 2014.